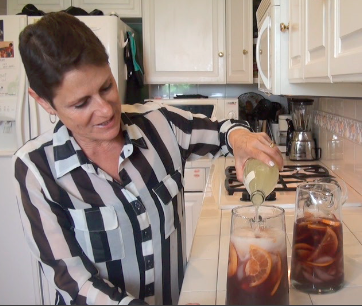 4th of July Manischewitz Sangria Recipe! This coming Friday is the 4th of July, and we are excited to be hosting our cousins from Mexico for Shabbat dinner. For this festive occasion, which combines Shabbat with the 4th, I have invented a Manischewitz Sangria that will knock anybody’s stars and stripes socks off! As it is infused with various fruit and liqueur flavors the Manischewitz Wine undergoes a metamorphosis, and comes out the most refreshing, smooth, and delicious butterfly of a beverage. Click on the link to watch my step by step recipe video. With my Sangria you won’t need any fireworks! You will also need either, two nice glass pitchers, or a punchbowl and ladle. Slice the fruit, and in a metal bowl, (if you have one), combine it with the entire bottle of Manischewitz wine, and refrigerate for 2 hours. Juice the 2 navel oranges. Remove the bowl from the refrigerator and stir in the 1 cup of orange liqueur, the 1/4 cup of brandy or sherry, and the 8-10 ounces of orange juice. Fill the two glass pitchers 1/4 full with ice cubes, and then ladle the Sangria with the fruit, into them. Just before serving pour one half of the bottle of Sparkling Lemon Soda into each of the pitchers, stir, and serve immediately! This coming Friday, I hope everyone has Happy and safe 4th of July, and especially a Shabbat Shalom!